Posted on July 16, 2010	by Michael Gorton, Jr. This bottle had some dust on it. It was laying on it’s side all the way at the bottom of the wine rack at a wine shop near where I work. I knew it was a Raphael from foil cap that was on the neck. What vintage and what varietal it was, was a surprise. 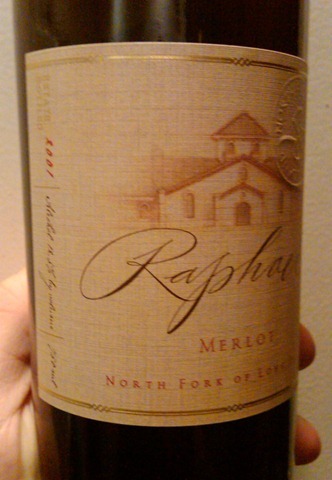 Raphael Vineyards 2001 First Label Merlot. I tried doing research on this and found that it did retail for $30.00. If I told you what I paid for it, I might go to jail – I would consider it stealing. According to records and the research I did, the 2001 season, at that time was the best yet. Grapes had achieved a high level of ripeness that had never been seen before. It was a long fall with no rain from September 1 till after the grapes were harvested in mid November. Looking back at Richard Olsen-Harbich’s winemaking notes is something to read. Rich was the winemaker at Raphael up until about two months ago. The description of the year and the harvest brings back memories to the 2005, 2007, 2009 and now the middle of the 2010 season. Where will this season take us. We won’t know until the last lug is in. But for now, we have this bottle of Raphael Vineyards 2001 First Label Merlot. On the nose I was picking up concentrated fruit – some blackberry, blueberry and plum were right up front. There was some leather and earthy spice. Grilled figs, minty herbs and a hint of dark coca rounded out the aroma. The taste brought a whole plethora of flavors. The concentrated fruit was carrying over along with the minty herb. There was more of a dark earthiness and dark spice flavor. The tannins were velvety and it was still lively with a nice food friendly amount of acidity. The finish was long with a nice herbal note. I am going back to pick up a few more of these. This entry was posted in 2001, Long Island, Merlot, Raphael. Bookmark the permalink.